The Mayo man is now 11-0 as a pro and is bringing a title fight to his hometown tomorrow night. Mayo's "Sugar Ray" has realised some new targets since failing to reach the Olympics two years ago. RAY MOYLETTE WAS one fight away from qualifying for the Rio Olympic Games in 2016. Chasing a dream which he had held for years, he fell at the final hurdle and was put in an awkward limbo – wait another four years to qualify again, or close the chapter on his amateur boxing career. He chose the latter and two years later is preparing to headline one of the biggest shows that Irish boxing has seen for a while, and is bringing it to his own home town. But Sugar Ray admits that “nearly nothing goes according to plan” in boxing and after the heartbreak of missing the Olympics, being in his current position — with a top 15 world ranking on the cards — wasn’t something that he could have predicted. After returning home from the Rio qualifying in Venezuela in 2016, Moylette took some time away from boxing. “I was living a normal life for the first time in my life after I missed qualification in 2016 for the Rio Olympics. I came back – it was July or August – and I was living a normal life for a couple of weeks, or a couple of months maybe. “So that’s when myself and [his coach] Martin Brennan contacted Packie [Collins]. We came up and did a bit of training. That was October maybe. I ended up signing pro in January 2017. It took me four months to get everything across the table and everything organised. “But I was probably seven or eight weeks or ten weeks idle. “Growing up in the boxing club in Westport, I always had the Olympics as the dream to chase or to be part of the high performance set-up. I always knew where I had to be, at what time and when. And I always knew what I was doing it for. 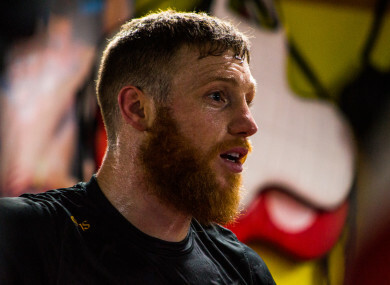 That decision to turn professional, linking up with Paschal Collins and his Celtic Warrior gym, has given Moylette the targets and dreams he needs to push himself in the sport again. “It’s great that we have changed everything around now and I’m back part of a structure again. Less than two years after turning pro, Moylette has a spotless 11-0 record, winning four fights by knockout. Tomorrow he will headline a homecoming title fight in Castlebar, 10 minutes away from the village of Islandeady where he grew up. The show, which boasts big names of Irish boxing from Gary ‘Spike’ O’Sullivan to Roy Sheahan and Craig O’Brien on the undercard, will be broadcast live by TG4. Moylette remembers Ireland’s pro boxing scene from 10 years ago well, when he appeared on the undercard of Bernard Dunne’s world title bout as an 18-year-old, fighting Dubliner Robert Gorman as amateurs. The Mayo man believes that it’s on its way back up again, and that he is “at the forefront” of its rejuvenation. A win on Friday has the potential to get Moylette a top 15 world ranking, something that would put him “well and truly on the ladder to the very top”. “The phone calls will come. We won’t need to be looking for the big time anymore. If everything goes well, they will come. If all goes to plan on this Castlebar show tomorrow night, Moylette is confident that boxing will once again become a regular feature on terrestrial TV. “This show will be bigger than anyone is expecting. People will see big-time boxing back at the top and that’s where it needs to be. And I think they will be looking for more boxing on TV. The last few tickets for tomorrow’s show are available from Sharon on (087) 7665307. Email “After missing his Olympic dream, Ray Moylette tried the ‘big, bad world’ for two months”. Feedback on “After missing his Olympic dream, Ray Moylette tried the ‘big, bad world’ for two months”.